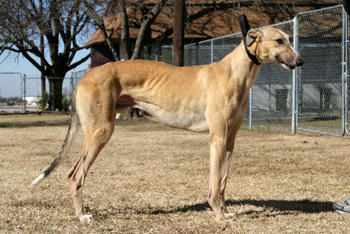 Gordon, aka Xtreme Grapple, is a 4 year old light fawn male born January 15, 2004. His sire is WW Time Warp and his dam is Alot of Heart, making his sibling Xtreme Dodge Ball. Gordon's 76 race career started on September 17, 2005, at Dubuque, Iowa, moving to Bluffs Run and ending January 19, 2008, at Valley Race Park in Harlingen. Gordon is not cat tolerant but is in a foster home with a Pug. We therefore believe him to be tolerant of small dogs. Gordon is a huge love bug and very happy boy! He loves nothing more than being with his human and just melting into you, literally. He is a human shadow and will follow you everywhere. He sleeps soundly throughout the night as long as he's been taken out right before bedtime and prefers to sleep beside your bed on a soft dogbed. Gordon is not fond of crating, but will go in the crate if a treat is thrown in should you plan to be away for a while. This guy is not cat trainable, but he sure fits in with this greyhound crowd. He does like to steal the show, but none of the other greys seem to mind. He's learning what "no surf" and "leave it" means, but he will test you when you are preparing meals, be it dog or human. He is right there by your side to make sure you know he can help with any dropped items. I've never seen a hound that was so interested in food and water. He loves food as much as he loves attention. Once he's settled down after his meal he is much calmer and will lay about for most of the evening until you get up - then he is your shadow again. Gordon truly believes that when you get up from whereever you are there could possibley be a snack awaiting him - in this respect he is a true dreamer. He is learning to master no jumping when meals are served and he does best if fed in a separate area until others have finished their meals. Always let him outside following eating and he will not disappoint you. Gordon has already mastered the stairs and is coming right along with his potty training. He hasn't figured out quite when to tell you he has to go outside, but he's learning and when he whimpers it's usually means he needs to go potty. He should be taken out often to start him off right in a new home and be rewarded each time he does his business - be it a treat or a loving gesture. His water intake needs to be monitored unless you are willing to let him out often. A belly band is also a good idea until he becomes accustomed to his new home. 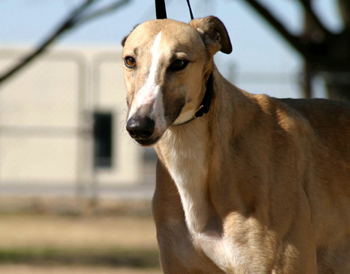 This handsome boy will make a great human companion because of his loving nature. He will need know his human is the pack leader as this guy, although extremely affectionate, has a strong personality and would really benefit from a dog training class with his new human. I have no doubt that Gordon is going to find his home quickly because if his endearing personality - he's just a really happy boy and rewards you with unending love. Gordon is an energetic and handsome boy! Though he has only been with me for a short time he has picked up living in a home very well. He has become the life of my house with his sweet nature and playful personality. He is always entertaining and readily by my side making him a wonderful companion and an absolute pleasure to have. Gordon is quickly learning the rules of the house and is respectful of the occasional "No, Gordon." We are still working on his manners when it comes to his excitement to see his human after being away for a while. He would like to jump up and give you a hug, but he is learning to settle for a rapid tail wag and a kiss from his human on his nose. Gordon is crated during the day. Although he is not excited about it, he will eventually ease in there with the help of a tasty treat! This guy is small dog tolerant as he gets along perfectly with my Pug. I can often find them curled up together on his dog bed. Meal time is always a treat for Gordon. I have never seen a dog so motivated when it comes to food and water. As soon as you set the bowl down its contents are quickly consumed. Once he has finished his meal and has gone for a walk, he settles down for the evening and makes circles around his dog bed until he finds just the right spot. He will stay there for most of the evening or until you get up - then he is your shadow again. Gordon truly believes that when you get up from wherever you are there could possibly be a snack awaiting him - in this respect he is a true dreamer. Potty training is coming along rather well for this first-time home dweller. For Gordon, as well as most any other dogs, it is all about a routine. If I keep up with my end of the bargain, Gordon always keeps up with his. 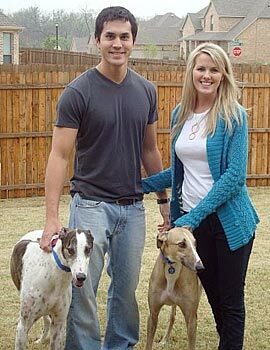 Gordon (now Tucker) and PeeWee (now Titus) with their mom and dad.